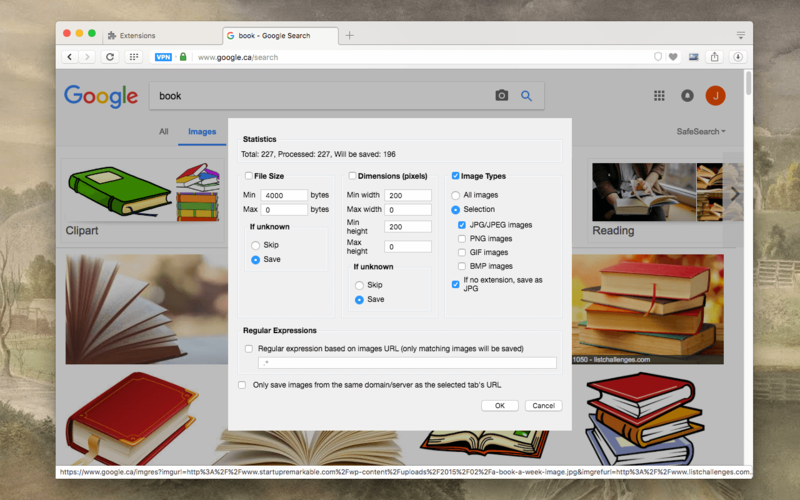 "Download all Images" adds a toolbar button to your browser that allows you to find, filter and save all shown images in the currently opened tab. The filtering tool is very powerful. You can limit images based on their dimensions, image type, or image size in bytes. It is also possible to use a custom regular expression filter to filter images based on their URL. Furthermore, it is possible to limit image downloading to the current domain as well. What is "Save all Images" extension and how does it work? This extension adds a toolbar button to your browser. Clicking on the toolbar button, opens a filtering window. In the top section, you will see the "statistic" panel. This panel provides information regarding the detected images. It has three sub-sections (Total, Processed, and Save). "Total" is the total number of the detected images in the current page. "Processed" is the number of images that their size and type has been resolved (for these details a HEAD request needs to be sent to the server. Once reply is fetched, the processed will be incremented.). "Save" is the total number of images that will be saved according to the current filter settings. How many images are going to be saved if I press the "OK" button? The number is shown in the "statistic" section. Note that filters are in different groups and there is a "AND" operation over all filters meaning an image needs to meet all the filtering rules in order to be added to the download queue. So if you just want to download images based on one criteria, just uncheck other filters. How does the extension find an image size and what is going to happen if an image size is not resolvable? There are two different cases. The image URL might be in HTTP or HTTPS schemes or it might be in Data URI scheme. For the HTTP/HTTPS schemes, a "HEAD" request is sent to the server and response headers are analyzed. Image type and image size will be obtained from these headers. For the Data URI scheme, both size and type are embedded to in the scheme and hence there is no server side request. How does the regular expression filter work? What is the use case for "Only save images from the same domain"? Usually websites use many resources from CDNs and also other networks. For instance in this hosting, there is a useful discussion section. Each of these section might have many images loaded in frames. By default, the extension detects all the images currently loaded in the page regardless of their origins. Using this option you can limit image detection to the current domain and hence get rid of all the images loaded from other resources. This way you can limit the number of downloading images a lot. If a website has a nested iframes (iframes inside iframes). Is this extension going to detect images in deep iframes as well? Yes, the extension detects all the images inside the page if they are already loaded. There is no limit on detection method if there is a nested iframe. Still these frames are inspected and all their loaded images are reported. You can use the same origin filter to ignore third-party images. Why the "processed" number is sometimes different from the "total" number of detected images? Sometimes, some servers do not respond to the "HEAD" request and hence image information such as image type and image actual size in bytes is not detectable. Still this extension tries to detect these values based on image URL but this is not an effective method. Why do I get "Cannot collect images on this tab" error and how can I fix this? If you try to collect images from web-stores (mozilla.addon.org on Firefox or chrome.google.com on Google Chrome) you will get this error. The reason is that for security concerns, extensions cannot inject scripts into these protected pages. Unfortuntely there is no workaround for this bug. Note that you can still use for instance Google Chrome browser to collect images on addon.mozilla.org! Also note that you will get this error if you try to collect images of another extension page (extension://*). For more info please visit https://github.com/belaviyo/save-images/issues/2. Can I download image links that are stored in a text file using this extension? Yes, allow the extension to access local files (file://...) from the extension manager of your browser and then drop the file in a browser tab. Now click on the icon and set the deep level value to 1 or 2 based on whether the links are actual images or they are just links to the pages that contain the images. How can I cancel an image grabbing job? When a tab is requested to be inspected, the extension injects a small script to detect all the images. This process may take some time depending on the total number of images that exist in the page and all its sub frames. This extension fetches all images and then analyze each one which takes some additional time. To cancel the entire process simply close the panel, that' it! Also if the panel is closed during the downloading stage, the download will be canceled as well. What is the meaning of the formatting in the "Save in" section? This is the template for the filename that is going to be saved. The default format is [title] - [date] [time]. To have a fixed name, simply replace the default template with a fixed name like "images.zip". To restore the default format, clear the formatting box. What is the meaning of the timeout box in the "Save in" section? This box defines the default timeout for the extension. This is the timeout that extension uses before interrupting a downloading job. Basically, if a server does not respond within this period, the image is being considered as broken. Why do I sometimes get fewer images in the final ZIP archive than the number that is shown in the panel? This extension has a timeout feature that interrupts a downloading job when the timeout reaches and the server is not responding. Most likely this is the reason. You can adjust the timeout value in the panel UI under "Save in" section. Also, some images might be broken and hence are not being included in the final archive. What is the difference between the deep search level 2 and level 3? In the deep search level 2, only IMG tags are being considered for the destination HTML pages (all web pages except the root one), however in the level 3, both IMG and A tags are being considered. Note that searching with level 3 is a very slow process as the extension needs to evaluate thousands of links. If you are planning to use these two levels, make sure to define custom RegExp filters for the domains of interest. What is the custom rules section in the options page and how to use it? For this hosting, since both images are available in the actual HTML document, there is no need for the destination HTML parsing. We can set the deep search to level 1 and the output will be only two images. Note that whenever a filter matches the top URL, the “Statistics” section will display the total number of the regular expressions that are limiting your search results.